Upon reflection of the week that was, I write from my modest yet comfortable hotel room in Bangalore, a 25-hour journey from Cherryhurst, door-to-door. I arrived to the city in the wee hours of Thursday morning, after an uncertain few days of travel planning. I was meant to be here last Sunday, but Eyjafjallajökull, the Icelandic volcano which has inflicted total chaos on European airspace, delayed my departure by four days. It also forced me to alter my route. I was originally supposed to fly with Lufthansa Airlines from Houston to Frankfurt, followed by another haul of a similar length to Bangalore, but after excessive days of delay and cancelled flights that reached into the thousands, the executive decision was made: I would fly with Emirates Airlines, on a non-stop flight from Houston to Dubai, around the mess in Europe, and then onto Bangalore. Fly Emirates I did, and it turned out to be the highlight of my week. Due to volcano-related tangles, our departure from Houston was behind schedule by 45 minutes. I could have cared less, though, as I had dealt with bigger issues in getting myself to that point. Happy to finally step aboard, I was met by a welcoming fleet of flight attendants, who offered glasses of champagne, water, and fresh-squeezed orange juice, as well as hot towels. I accepted their offerings. One of them then showed me to seat 10B, my personal space for the next 15 hours on the luxurious aircraft that is Boeing’s 777-200. Once settled, I was pleasantly surprised to see that nobody would be sitting next to me. 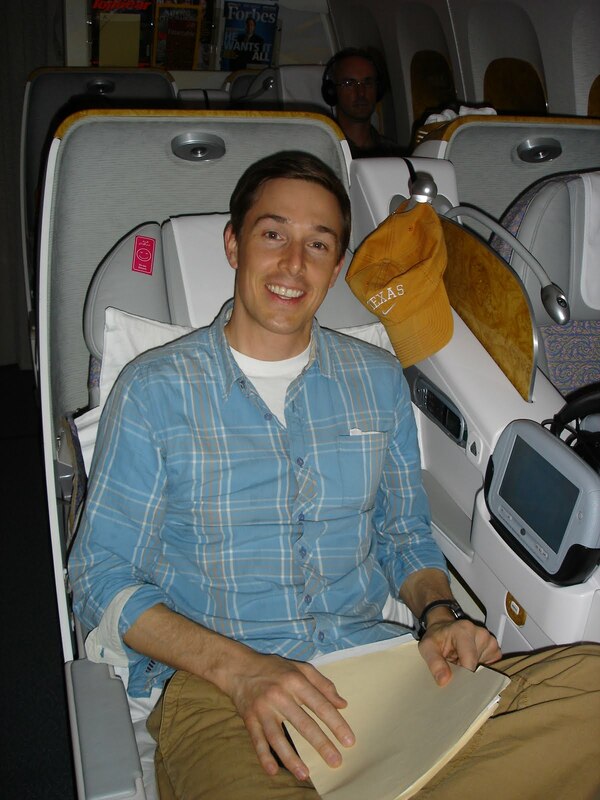 This was my first time in business class, on any airline. My level of comfort had already evolved beyond anything I had experienced on a commercial flight, and we had not yet left the tarmac. I flew coach with Emirates a few years ago, round-tripping from Dubai to Istanbul—a primetime ride, yes, but business class—I can now state—is on another level: to me, it might as well have been first class. At takeoff, I noticed fellow passengers, who behaved as if they had been in this situation before, fiddling with their armrests and looking determinately at the personalized screens on the chairs in front of them. As it turns out, they were familiarizing themselves with ICE, or Information, Communications and Entertainment, Emirates' on-demand multimedia center. Loaded with movies, podcasts, audio books—whatever one could possibly need to combat in-flight boredom—ICE has it all, including SMS messaging capability and access to cameras outside of the airplane for bottom and front views. Dinner was excellent. I had a glass of French wine along with it. I watched By The People: The Election of Barack Obama, a documentary about the president's campaign to win the White House. Once finished with that, I leisurely reviewed the music selection, deciding on Steely Dan. Surely the sound of Aja would put me in the mood to catch much needed rest. It did, and a flat-lying seat with a thin-spreading mattress only added to sleep inducement. Facing the artificial stars on the ceiling above, I was soon out like a light, with Emirates-furnished noise cancellation headphones wrapped around my head, and did not wake up for eight hours. When I did awake, the friendly attendants were nearby, ready to serve, and to my knowledge, had not gotten a wink of sleep themselves. I stood up to stretch my legs, walking in a pair of Emirates-provided socks, with the intention to use a fancy dopp kit also provisioned by the airline. Waiting for the bathroom, I struck up a conversation with the attendants and seized an opportunity to remember the experience with a photo, even if I had slept through much of it. From Turkey, Serbia, and India, all three ladies led me to believe that they enjoy working for the airline. If Emirates treats its employees remotely close to how it treats its customers, it is well they should. There is something to be said for cheery attendants. They can make or break a flight. Following yet another tasty meal, we arrived to Dubai International Airport (DXB). Upon arrival, I noticed, since we had left Houston late, that I was on a compressed timeline to catch my flight to Bangalore, so I needed to scoot. I skipped through the Emirates Business Class Lounge, freshening up for a few minutes there, and before I knew it, was back in familiar territory: in a business class seat with Emirates. Not long into the second flight, I was served another fine meal and a glass of wine, this time Californian. I knew what to do after that. Looking to the arm of my chair, I reached for ICE, delving into its deep music for a selection fit to accommodate a leftover tinge of sleepiness, leaned back and closed my eyes... into dreamland I went again. Two hours later, I awoke to the sound of a pilot saying something in Arabic about our descent, and stumbled to the kitchen and bathroom areas for another pre-landing stretch. Meantime, I struck up a conversation with a congenial Indian attendant, a man of about my age (34). Looking at my watch, I realized that we were on track to land early, but inquired to confirm that I was tracking in the appropriate time zone: "Are we arriving to Bangalore early?" "Yes," he replied, "by about thirty minutes or so." I smiled contentedly; this news of an early arrival had just completed my dreamy experience. As I turned to head back to my seat, he said, "Even time flies on Emirates." I found the cameras on the front and back of plane particularly interesting... good read! 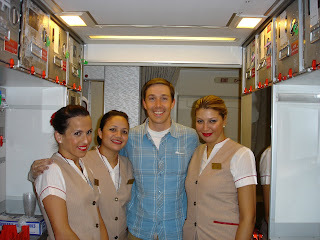 Well Chad, u sure did enjoy the Emirates flight. Fly the Qatar Airways next time and I won't be surprised if you find it as inviting ! Its another magical airlines if I should not be making an overstatement. I hav just about started floating my thoughts into the Web. SO, you'll find just a couple of them as of now. Looking forward to reading more from you.